Are your trampoline springs stretched out of shape or broken? Or, you just look for springs to assemble your trampoline? 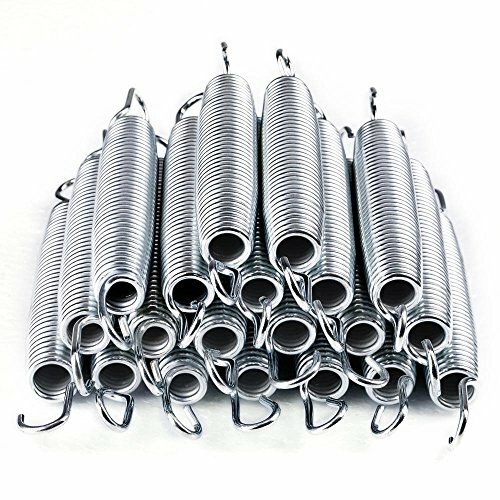 Here comes our Heavy-Duty, High Tensile Springs made from Galvanized Steel, which will be good choice for your replacing or assembling. When replacing your trampoline mat, it is a good time to inspect all trampoline springs. Trampoline springs that are over-stretched, loose or have damaged hooks should be replaced for your safety. Note: You will take a spring OFF of the trampoline, make sure that it is fully recoiled and measure it from hook-end to hook-end. View More In Parts & Accessories.